CSL broke ground in 2017 by hosting the first collegiate Madden league and we're excited to continue that trend in 2019 by adding NBA 2K to our league! 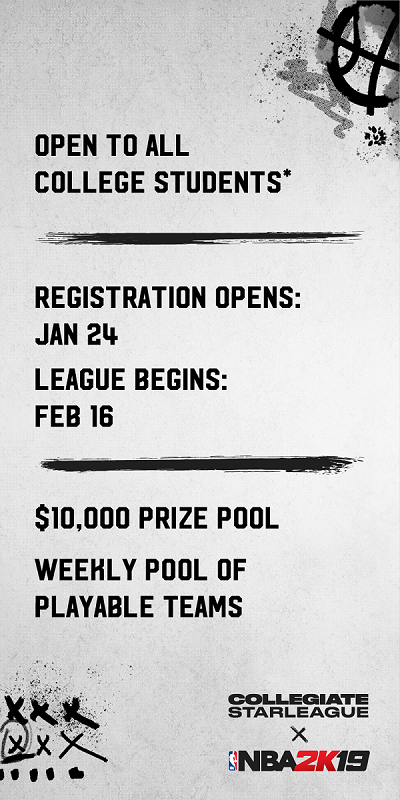 Registration for the league opens today and we have $10,000 in scholarships up for grabs for the top collegiate players. League format: All players will be placed into groups and play a round robin format, meaning every player will play every other player him his or her group. The top teams in each group advance to a single elimination playoff bracket. There will be up to (2) matches played back-to-back each week, depending on registration numbers. Match format: 1v1, where each player chooses a team from among the pool of available teams each week. Every week, a pool of eligible teams will be available to be played and players must play with one of the available teams (I.E. the Warriors won't be available every week). For specific rules, please check out the rules page! Group stage matches are Best-Of-One, but for playoffs expanded Best-of-three matches, a different team must be used for each set by each player, meaning (3) unique teams must be used by each player. Leagues: For clarity, there are two separate leagues: one for XBOX players and one for PS4 players -- please check which league you are signing up for! Only input your selected console information into your CSL account (do not put both) and make sure to select the correct one when enrolling in the season! Great -- how can I sign up? 1) Click the "Sign Up" button and fill out your information. Once this is done, click to complete your player profile. 3) Click the "Create team" button and make your team! Each team consists of only one individual participant. 4) On your team page, click the enrollment button and you're done! Note that each player must create and enroll their own individual team in one of the console seasons. We're looking forward to an awesome year and hope you all enjoy for inagural season of collegiate NBA 2K! Is there anyway that this league could be proam? That way its 5v5 and more competitive?